Sophsterlicious • UK Blog: Nicole by OPI - Rich In Spirit NOTD. Hey Everyone! 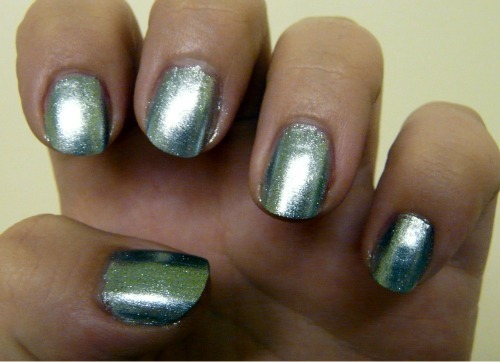 Here I have another NOTD post with one of the gorgeous Liquid Metals from Nicole By OPI. I used the shade Rich In Spirit. .
"This metallic silvery blue-green is all you really need." It is a beautiful metallic silver/blue, that chances colour depending on the light you are in. It's a lovely colour and it took three coats to get the bottle colour, only thin coats though, and this polish dries so quickly that it's not even a problem, and for a eye catching finish like this .. It's fine! If you want to see my other NOTD with 'It Starts With Me' - Click Here. These polishes are available from this month from Boots Online, or Instore. Priced £7.95. Absolutely LOVE Nicole by OPI! Their longevity is superb!! Oooh loving Rich in Spirit!